NEXCOM, a reliable partner for the intelligent solutions, is now providing NEIO-B1841 as its new version of EtherCAT slave I/O devices to include analog I/O module in addition to digital I/O module for our users to much easier build up their control system. As Internet of Things is accelerating into its comprehensive commercialization phase, a more-function-included I/O module actually can optimize automation processes that rewards EtherCAT users simplified device set, efficient production flow and for sure further cost efficiency. NEIO-B1841 can easily handle a collaborative functionality with peripheral devices that install of sensors to function as analog data collection such as distances, flows or forces, on top of collaborations via digital I/O modules. 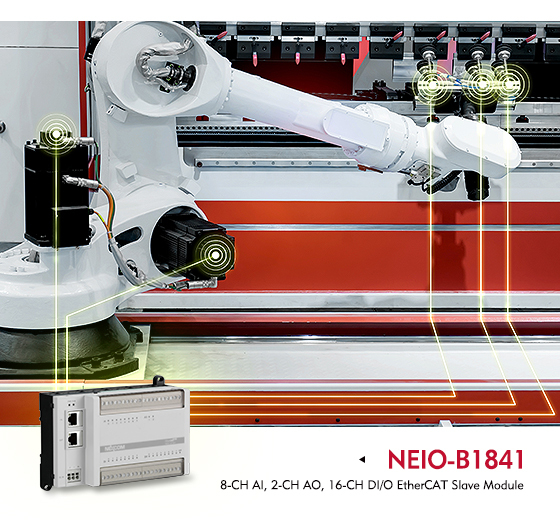 NEIO-B1841 rewards EtherCAT users an on-shelf product providing flexibility for them to instantly tailor their own specifications into their control systems. Multifunction DAQ (8-CH AI, 2-CH AO, 16-CH DI/O) is inclusive for individual choices. Its analog input and output module can be switched between current and voltage modes while the ranges are also adjustable under both modes. The resolution reaching 16 bit and sample rate reaching 1K Hz is all listed into top quality level. NEIO series provides EtherCAT slave I/O module series products for distributed industrial applications, with each to be equipped with high density I/O (up to 32 points) and powerful features in a compact size, to satisfy the users an easy installation and cost advantages, especially for machine control and robotic control applications. Such applications can be any of control systems, including robot control system, factory automation, machine automation and power control panel. NEXCOM is providing total EtherCAT motion solutions, ranging from new system design till customized build, with comprehensive products from its own factories including EtherCAT master controllers, EtherCAT I/O , EtherCAT motion controllers, EtherCAT slave modules and even EtherCAT slave chips, as well as robot arms applicable to various industries and configuration tool controlling motions. CNC, general machines, collaborative robots and industrial robots are all possible applications. Product Information and Specification Details, please Click Here.